It’s time once again for a Linux distro review. This month, Antix 7.5 was included on the LXF DVD. It’s another light distro, so I will use the same metrics I used in the Lightweight Linux Throwdown. 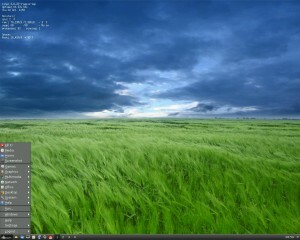 Antix is based upon Mepis which is, in turn, based upon Debian. I think at one point it was based on Ubuntu, but I think they’ve gone back to being based on Debian. So, let’s get down to it. Here’s a screenshot of my desktop upon boot. As you can see, the default Window Manager for Antix is Fluxbox. (Although IceWM is available from the menu) There’s a neat system monitor running in the top left corner. It looks pretty nice and the default terminal style uses fake transparency (it clones the desktop background). The system colour scheme and fonts are easy to read and use. It has a slight military feel to it – the workspaces are named Alpha, Bravo, Gamma and Delta. The default browser in Antix is IceWeasel 3.0 – which is basically Firefox 3.0 with different artwork. I guess Mepis uses this from Debian and Antix has left it unchanged. I think, probably, anyone using Antix is enough of a Linux pro that they know that IceWeasel is the same as Firefox and won’t get flustered. I’m not really into the IceWeasel theme, but that can easily be changed. It just worked when I booted. That’s how it should be. mtPaint was included here, as in Damn Small Linux. Nana and Leafpad are included for text editing. For office Abiword is included for typing, as usual with these lightweight distros. Gnumeric is the spreadsheet program, par for the course. Pidgin is included for instant messaging. This is a much more fully-featured program than is usually included in these distros. IRC is done via XChat – again, pretty nice for a lightweight system. Dillo is included, as usual, but it’s pretty useless in my experience. Links2, a commandline browser was available as well. I recently learned ( I think in Linux Format Magazine) that Links2 is also capable of displaying images! Usually elinks, lynx, and so on do not display any images – limiting your web experience. Now you can get the uber-fast browsing experience of using a commandline browser and still experience images. So if you’re using Anitx on a very low-powered PC, this could be very useful for you. For audio and video we have xine, mplayer, and xmms. (And a few others) And for games there’s Mahjong, Chess, and Dosbox. 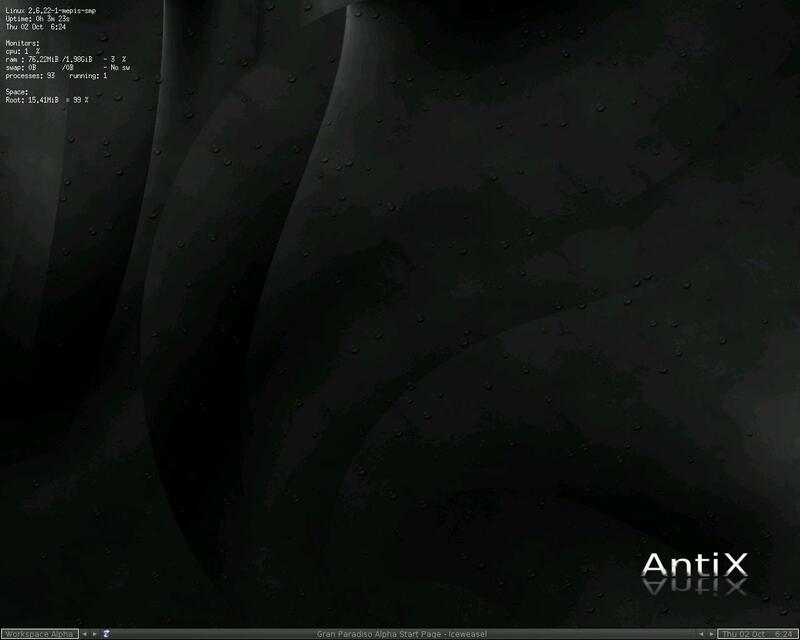 So, over all, I think Antix is the best, most fully featured Lightweight Linux distro I’ve tested thus far. It even beats out Puppy Linux 4.0. So my current recommendation list would be Antix, Puppy Linux, and then Feather Linux. If you have an older computer that you don’t want to send to the junk bin – install Antix! You get the awesome Debian base under the also awesome (so I’ve heard) base of Mepis. You get nice, functional software and there weren’t any boot problems. I didn’t need any “cheat codes” to get it to boot. It looks good and, with a package that would add icons to the desktop, I’d probably use this for the guest computer so visitors could browse the web without me worrying about them introducing viruses to my computers. Oh, and it looks slick with the “transparent” xterms. Let me end with a screenshot of the IceWM environment, which I would recommend if you wanted to use this for a guest computer where people will be expecting Windows and looking for a “start menu”.